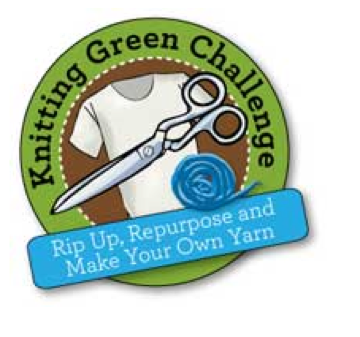 I think I might take part in Knitting Daily’s Knitting Green Challenge, which urges handicrafters to create some sort of project out of reused yarn, tshirts, and any other kinds of materials that are otherwise trashed. Sounds like a spiffy fun idea; photos of finished endeavors can be posted to their forum. My mind is already swirling with unconventional ways of using garbage and re-purposed yarns from sweaters or the like to come up with something. You can read all about the challenge, in conjunction with Earth Day April 22, here. What do you think? Should I participate? Will You? Would this be a good challenge for my knitters in school? Should I propose it to them?